Check out the brand new Caesars Online Sportsbook! Their sports betting platform is fully integrated with their existing Caesars Online Casino, however, we’re still waiting on the exclusive Caesars Sportsbook Bonus Code. Caesars Casino has long been present in Atlantic City and Las Vegas, but their Online Sportsbook product is something special to New Jersey, at least for now. Look for sports betting at Caesars to expand to every state where there is a Caesars property. Soon enough, most Americans will be able to place exciting sports bets with Caesars Sportsbook bonus codes! How do you get the Caesars Sportsbook bonus code? 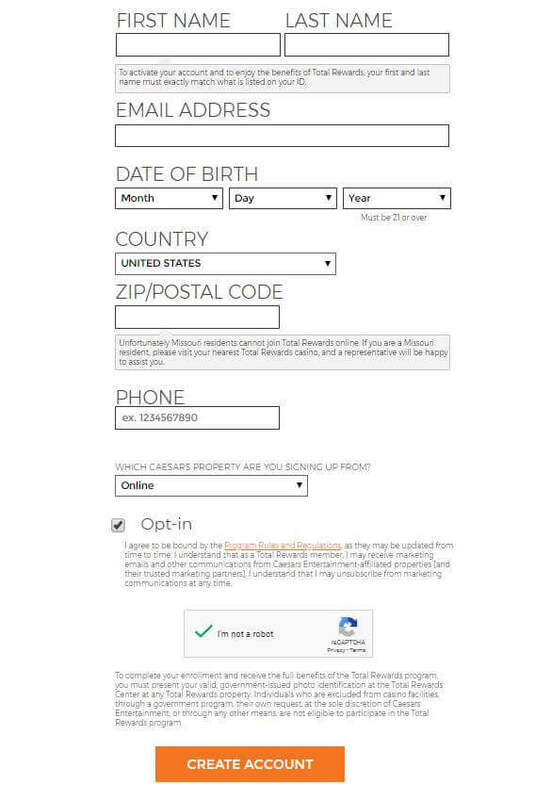 The Caesars Online Sportsbook has a very straightforward registration process. Follow our simple steps to start your sports betting experience. Pro tip: be on the lookout for sportsbook bonus codes! Begin making sports wagers, and good luck! Caesars Online Sportsbook has just recently kicked off, but we’ve checked out what wagers there are to make and we’re quite surprised and happy with the betting odds selection for a brand new online bookie! We’ll give you a quick breakdown of how the Caesars Sportsbook looks on both desktop and mobile as well as which sporting events will have the best odds. Other Caesars products (like online casino) have both iOS and Android apps for Apple phones and other devices. However, it’s unclear whether or not the Caesars bookmaking product is that far developed or not. We do know that the sportsbook works just fine in a mobile browser like Safari. You’re completely able to make sports bets and check updated odds on mobile with this sportsbook. You can even register from your mobile device with the Caesars Sportsbook Bonus Code when it becomes available if you want to get all the usual signup perks! The odds are the same no matter if you’re on your computer or phone. So, place your bets at home on your desktop and follow the betting odds updates live on mobile! Be sure you make smart bets. Sometimes it can be too easy and quick to place sports bets when you’re on the go and in a hurry. Every bet you place should be well researched and thought out. You can survive one or two bad bets in a row, but it quickly becomes increasingly frustrating to keep making poorly thought out wagers! Not only is there a sports betting platform operating in both NJ and NV, casino-goers in New Jersey are also able to play online casino games! As long as you are physically present in NJ (and above 21) you’re able to download the casino app and play Caesars Casino games online. Choose between a variety of popular slot titles like Cleopatra or Asgardian Stones. Additionally, you can find table games. Of course, BlackJack is the most popular of the online casino table games but you also have roulette and many variations of Video Poker. Caesars Online Casino is on of the bigger and more popular iGaming apps in New Jersey. Caesars Casino in Atlantic City (and other locations, of course) is part of the Caesars Entertainment Corporation. This corporation prides itself on being the most diversified casino-entertainment provider, and now they back up this claim with an integrated Online Sportsbook. Look for the Caesars Sportsbook bonus code if you’re in the Garden State and want to bet on sports. Also, pay attention to the new locations where you’ll be able to sports bet online with Caesars products. They’ll surely expand to other states and we’ll keep everything updated here on US-bookies! This sportsbook is brand new, but we can tell from its polished appearance and good odds that it’s going to be a real player in the American sports betting market, starting in NJ. Plus, if their casino product is anything to go by, bettors can expect solid services and fun experiences in the sports betting world. The Caesars Sportsbook is one of the first online bookies in America and they’ve set the bar high for their competitors. As more and more players enter the market and competition increases, look for enhanced odds, special promotions, bonus codes, among other incentives! For now, enjoy your time betting on sports get used to betting before the NFL regular season kicks off!